Previous: ARE FART PARTIES GOOD FOR YOUR HEALTH? Fans and friends mourned the passing of DJ Tekno4eva yesterday after he fell to his death while taking a selfie atop the Mont Royal Cross. 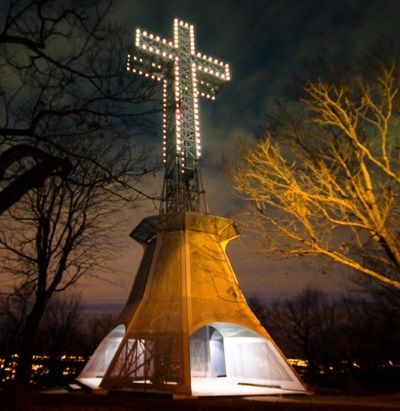 Tekno4eva, whose real name is Bernard Bundleworth, was celebrating his 21st birthday on Mont Royal when his friends challenged him to climb up the cross that adorns the top of the hill. Bernard, who has never shied away from a terrible idea, jumped at the chance to test fate. The Universe gave him a failing grade, but his friends gave him an A+ for effort. “Bernard was such a funny guy,” says Alice Whitman, who witnessed his fall. “And even though his death is tragic, I know he died doing what he loved, which was acting like an irresponsible drunk." Many of Bernard’s other friends concur. “If you’re going to die, you might as well die in a way that’s thoroughly ridiculously,” says Petrov Deslausier, another one of Bernard’s friends. “Bernard lost his balance on top of a giant metal cross while trying to use a selfie stick. It’s not a dignified way to go out, but it embodies Bernard’s thorough lack of respect for propriety or common sense." Not everyone is so nonchalant about Bernard’s demise. “Bernard had a problem with alcohol and drugs,” says Tracy Legault, his ex-girlfriend. “I had to break up with him because I couldn't stand to watch as his so-called friends enabled his self-destruction. I warned Bernard that if he didn’t clean up his act, it would end badly for him. I’m sad that his life ended the way it did, and I hope the friends who encouraged his dangerous behaviour take responsibility for the life they helped destroy." Bernard’s friends think Tracy needs to lighten up. “Hey, there’s nothing wrong with encouraging alcoholics to behave recklessly,” says Petrov. “It’s funny!"